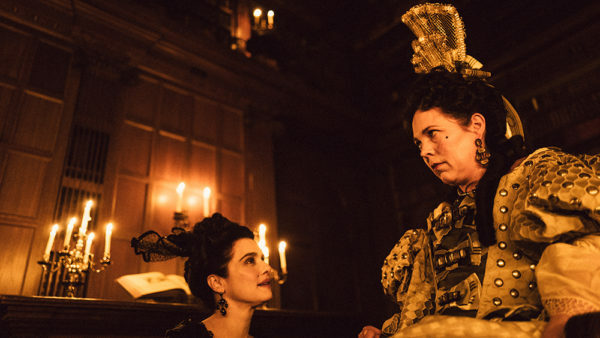 A lavish period piece set in early 18th century Britain, The Favourite brims with intrigue, personality clashes, power struggles and secret sexual liaisons. At the center of it all are Queen Anne (Olivia Colman), the last Stuart monarch; Sarah, the Duchess of Marlborough (Rachel Weisz), her childhood friend and closest advisor, and Abigail Hill (Emma Stone), Sarah’s cousin and eventual adversary. The film, an engaging and sumptuous costume drama, is expertly crafted. It unfolds in candle-lit gilded rooms adorned with masterful paintings, beautiful tapestries and extraordinarily fine furniture, in exquisitely manicured gardens, and in lush fields and forests. From an aesthetic point of view, The Favourite is no less than astonishing. Abigail, down on her luck but still aristocratic in terms of her demeanor, is invited to Anne’s palace by Sarah. As she arrives by horse-drawn carriage, she falls straight into the mud. Sarah assigns her to kitchen duties as a scullery maid, but she soon graduates to lady-in-waiting. In this role, she attends to the queen’s inflamed leg. Anne, plagued by an assortment of ailments, is confined to a wheelchair. She keeps 17 rabbits as pets, each one representing a child she lost while pregnant or after birth. Constantly afflicted by pain, she can hardly concentrate on the affairs of state. Sarah, whose husband is an army general, convinces Anne to wage war against France and raise land taxes. These are potentially ruinous policies, but Sarah keeps Anne onside by sleeping with her. Harley (Nicholas Hoult), an ambitious politician, tries to recruit Abigail as a spy, but she’s scrupulously loyal to Anne. Nevertheless, he tries to seduce Abigail. Much to Sarah’s annoyance, Abigail ingratiates herself into Anne’s good graces by “servicing” her. As a result, Sarah loses some influence in court. “She’s a liar and a thief,” claims Sarah in a vain effort to undermine Abigail. Undaunted by her failure to sully Abigail’s reputation, Sarah asks Anne to dismiss Abigail, but to no avail, whereupon Abigail devises a plan to inflict harm on Sarah. Ultimately, in an unremitting battle of wills, Abigail outmaneuvers Sarah. By then, Anne’s physical and mental health has so deteriorated that she’s virtually incapacitated. Weisz and Stone are more than convincing in their respective roles as royal rivals, but Colman delivers a memorable performance as the mercurial queen. Thanks to their outstanding performances, The Favourite usually achieves a level of excellence.